When Shirley Lock’s parents passed away, she moved into a residential group home. The staff and residents all were welcoming, but she missed being part of a traditional family. That’s where Simone Stevens came in. Simone, a program manager in the Barber National Institute Supported Employment program in Philadelphia, was interested in exploring Lifesharing through Family Living. With this residential option, an adult with disabilities lives with a provider companion or family in their home in what is meant to be a long-term, enduring relationship. 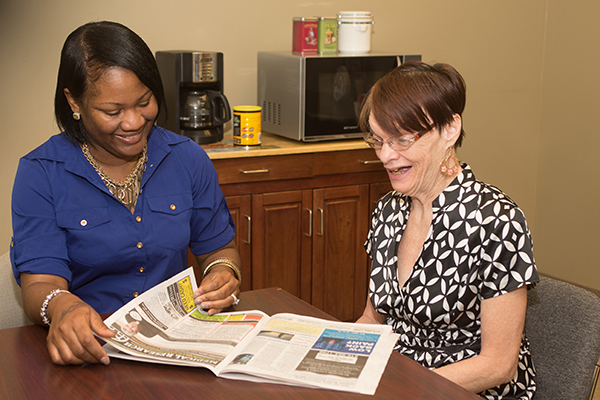 Shirley already knew Simone from attending the day program and having a job in the community. The Lifesharing support team arranged for Simone and her daughter, who was then 11 years old, to have dinner together. After a few meetings, they progressed to a weekend visit, and Shirley finally spent a week in the Stevens home. Over that time, they all came to believe that Lifesharing would work for them. Shirley agrees that it is a positive experience. “I like living with Simone. She takes good care of me,” said Shirley.